When you play D&D (or any kind of classic fantasy Role Playing Game) the game universe crafted by your GM is typically laden with certain game specific tropes. Because it is a collaborative medium, and because it is a game with rules and win states, the functional world is expressed through that lens. The GM can’t help but create scenarios with plot hooks and quests that railroad the players toward prepared material and fence of sections of the world that are not fully realized yet. Players can’t help but be a little bit genre savvy and incredibly blasé about saving the world every other Tuesday. This was my introduction to the gaminess of RPG. When the enemy shows up, you ready your weapons and start rolling. When you’re in a tavern, people recognize you as adventurers and give you quests. When you go into a dungeon, there will be a boss fight and loot at the lowest level. Unless you are actually playing a game specifically designed for collaborative narration, the stories that happen at the gaming table will be predictably different from the stuff you might have read in a novel. Because most fantasy novels do not start with five of people armed to the teeth with magic artifacts going into a tavern on an off-chance someone will need a dragon slain, because that’s what they do for living. The series has no shortage of violence and gore. The DM of the Rings comic is a brilliant, humorous exploration of this specific clash between a classic book storytelling intersecting with collaborative gaming aspects of RPG. The narrative breaks down, because the player expectations and the game play structure of quests, battles and rewards inherent to the role playing systems. The players are always three pages ahead, always pre-empting and second guessing and always pushing against the boundaries of the story, because of course they are. So if you set out to re-create Tolkien at the gaming table, you are bound to fail. Conversely, going the other way around sometimes works out fine as illustrated by the comic itself. That is basically the concept behind Rat Queens . It is a fantasy story that might as well have been a dramatized chronicle of your last D&D campaign. It features a genre savvy protagonists, who are self proclaimed “adventurers”, because of course they would be. They start in a tavern (where else) where they start a massive fight (as you do) and get thrown in jail. As a punishment they are given a quest to clear out some goblins from a cave near by, and they shuffle off, grumbling and complaining about insufficient loot prospects of the whole endeavor. No, seriously. This page is like a visual representation of a critical hit table. DM of the Rings is a cynical, and humorously jaded deconstruction of bad campaign, where neither the players nor the GM are on the same page with respect to what they are trying to accomplish. 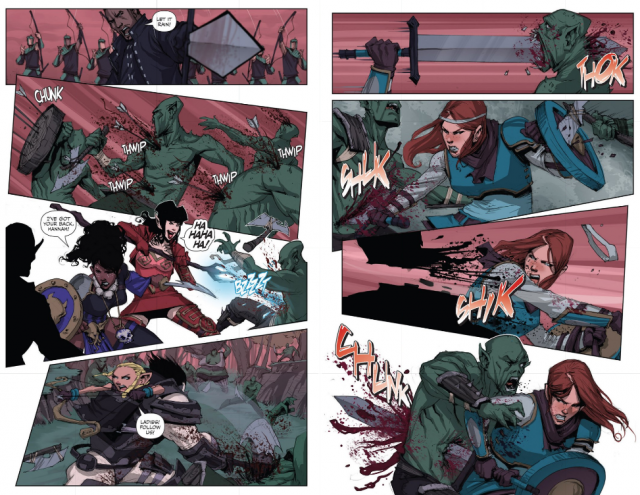 Rat Queens is something different: instead of poking fun at the disconnection between structured storytelling and role playing it embraces it. It is a love letter to D&D and the type of collaborative storytelling which happens at the gaming table. It is a faithful reconstruction of a good campaign: one in which both the GM and the players are on the same page, and just want to have fun and pull of a series of wacky hijinks and spectacular heroic battles because that’s what you do. While the comic is heavily influenced by RPG, it is not particularly interested in saying anything about it. Gaming tropes and structures inform the narrative and the characters but the fourth wall is never broken, and there is very little meta-commentary with respect to the RPG medium. It is just a story about quirky, genre savvy adventurers set in a fantasy universe where there are quests, loot, convenient plot twists and where four person teams composed of a warrior, rogue, cleric and a mage are a common sight. It is a story about quirky, idiosyncratic characters existing in an oddball fantasy universe with familiar rules and tropes. It is fun, funny and occasionally rather clever. Pleasant diversity, because why not. It is also pleasantly diverse. The story takes place in the town of Palisade which is a racial and cultural melting pot that is full of all kinds of different people. Fantasy as a genre has always struggled with representation. Despite there being a concrete evidence of people of color being not only present but also often prominent and influential in the middle ages, popular culture usually usually represents medieval Europe as uniformly white and heterogeneous. This carries over to fantasy stories inspired by these period pieces. So we end up with settings where Elves, Orcs and dragon people are a common sight, but people with darker skin shades don’t even exist. 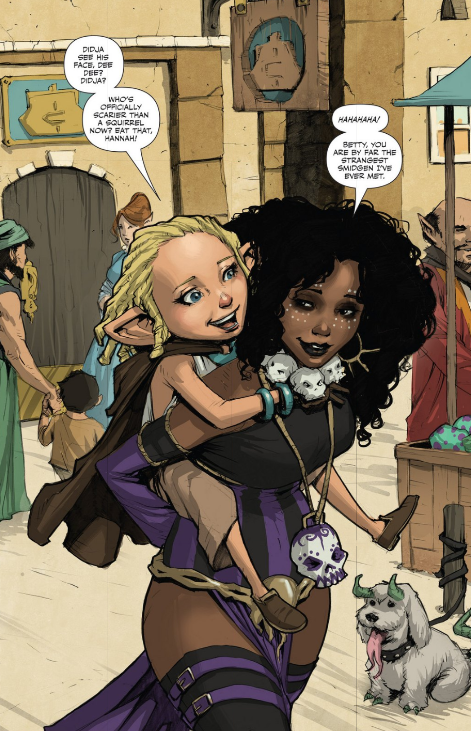 Rat Queens breaks away from that trend and embraces diversity. While it features the usual fantasy races such as Elves, Dwarfs, Orcs and Halflings “Smidgens”, it also draws a healthy number of prominent characters as people of color. Similarly, there are gay characters, because why wouldn’t there be? All of the protagonists, the titular Rat Queens (which is the name they given to their adventuring team – it’s a thing you do in that setting) happen to be women. This shouldn’t really be unique or surprising, but it is because I can’t think of a any other fantasy story which features an all-female cast of heroes. I would like to direct your attention toward the horned demon puppy in this picture. Also, Dwarf women grow beards in this setting, and shaving them is frowned upon by Dwarf society. Actually, the whole female beard thing is interesting because it makes an interesting commentary on how our own society polices women’s body hair. It’s not preachy, and it doesn’t hit you over the head with the message. The whole thing is written in a funny, charming way and when one of the heroes shaves her beard in act of defiance and rebellion against stringent, suffocating conservativeness of Dwarf society most readers will cheer her on. But the commentary is there, and it does sink in. It’s somewhat subtle, which is why I mentioned the series can be really clever when it wants to be. Rat Queens is a fun series, but keep in mind it is not Saga. It is not at that level, but then again, few things are. Still, if you are looking for a light, amusing and occasionally clever fantasy romp heavily inspired by D&D, it is worth picking up. It is also a great example of how you can create a setting that is diverse and which sometimes can make points about social issues without sacrificing your ability to have potty mouthed characters who engage in drunken debauchery in between extremely bloody and violent battles with monsters. This entry was posted in comics and tagged fantasy, review. Bookmark the permalink. Uh, Luke, I’m pretty sure that’s four…. By the way, there’s a popular German RPG (“Das schwarze Auge”) which specifically points out that dwarf women don’t grow beards. I blame Terry Pratchet. Rat Queens is pretty good; light and funny. Saga, on the other hand, has been disappointing – the whole marital disagreement is just a moldy cliché, which is a shame coming from the same comic that brought us Lying Cat and the royal Robots. In the realm of fantasy comics with strong female lead characters, I’ve been really enjoying Umbral. It’s dark rather than funny, but it has some great artwork. 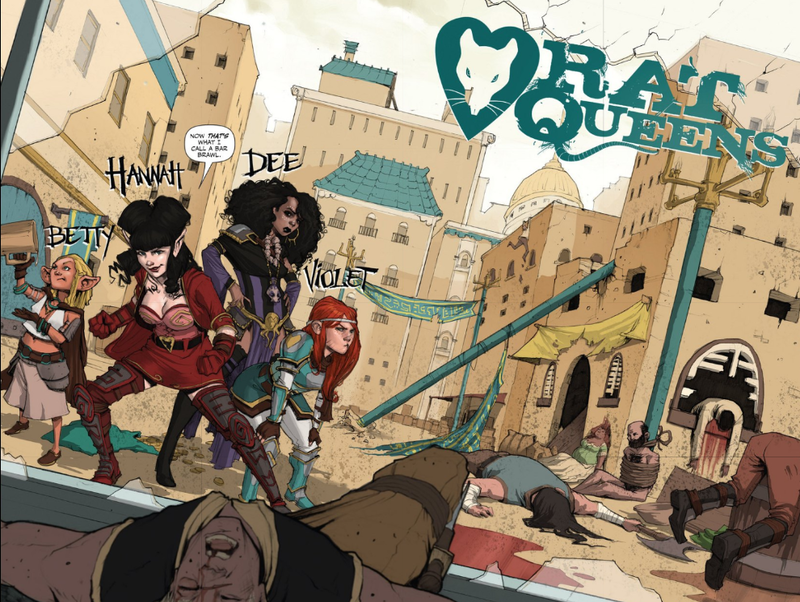 By the way, the wiki says a TV series based on Rat Queens is being planned; I wonder what they’ll do with it. And yeah, I think most settings assume that Dwarf women do not grow beards. This might very well be a nod towards Pratchet. The last few issues of Saga were kinda slow but I think it’s picking up again. Gwendolyn and Lying cat are back. Prince Robot is back in action. The family is in danger again, and the plot thickens. I’m still enjoying it. I tried a couple of times last year to try and get back into pen and paper roleplaying but just never really felt satisfied. I mainly played through Roll20 (which is absolutely amazing in my opinion) but consistently had problems with no-show players. I also kind of get tired of getting paired with munchkins when I’m more into the role-playing aspect (if I wanted a number crunching game, I’d go play a co-op CRPG or something). Pen and paper is just really dependent on the people you play and it’s hard for me to find people that have the same interest. Maybe I should give a different system a shot. Different systems attract different people I guess. I was mainly doing FATE last year since I wanted a system that placed less emphasis on number crunching. I’m thinking about doing Shadowrun, Dark Heresy, or maybe Call of Cthulu this year. Anyways, back on topic, Rat Queens looks really cool and I’ll definitely pick up a copy. Thanks for the review! Picked Rat Queens up after your review, and I loved it. I really like the adrenaline-junkie angle on the adventuring party, something my regular group has used in the campaign I am running (5th edition). It gets kind of hard to justify going out on dangerous adventures when you have a small fortune in gold and diamonds at home, unless you are just really into that sort of thing. You should also look into the “worlds” games too then. Dungeon World is loads of fun as well as Monster of the Week (Buffy, X-files, Supernatural type game), the system is also very good at preventing munchkining.